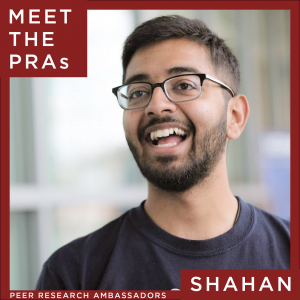 Meet Shahan Kamal ’19 (CLAS), an OUR Peer Research Ambassador (PRA) majoring in Molecular and Cell Biology. What is the focus of your research/creative activity? My research is focused on using computational methods to learn about the genetic connections to colorectal cancer. Why did you get involved in research/creative activity? I got involved in research because I saw it as an opportunity to learn firsthand about the applications of techniques and technologies from the classroom and utilize them in the real world. I would advise freshman to not be afraid to ask any questions or pursue any opportunity. Every experience has some sort of benefit, but you can’t gain any experience if you don’t go after an opportunity. What do you enjoy the most about participating in research/creative activity? My favorite thing about participating in research is the rewarding feeling of making progress. It can be a grind sometimes, but progression is incredibly gratifying. Describe the impact your research experience/creative activity has had on you. My research experience has allowed me to grow as a critical thinker and be more comfortable dealing with unknowns or not knowing what might come next. The confidence to do work that doesn’t have a confirmed outcome is incredibly valuable and has completely changed the way that I approach my work. This entry was posted in Peer Research Ambassadors, Undergraduate Research Profiles.